Sonrise Beach resort sits on its own private secluded cove and is ideal for sunbathing, snorkeling and relaxing. There is also a mini spa suite complete with whirlpool on private sun terrace with 360 views of unspoiled nature, pink bamboo queen size bed and love seat that are all are on our private white sand beach in the cove. 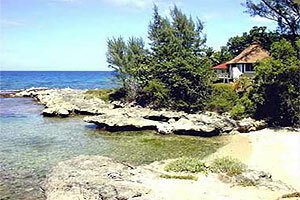 There is great swimming sunbathing snorkeling and diving on spectacular unspoiled reefs. While fishing, bird watching and hiking to empty black sand beach, hidden jungle waterfalls or colonial ruins all one hears is the sounds of nature no phones, no traffic no disco we feature delicious homemade tropical fruits and juices vegetarian and traditional Jamaican cooking welcome families groups honeymooners nature lovers seekers.